Puff pastry with river shrimp in purse shape (河蝦肉鬆手袋酥) - very fine puff pastry with many layered rings, which was a little too large and too delicate to pick up with chopsticks. Not bad. Barbecued pork (玫瑰蜜汁叉燒) and roast pork belly (燒腩仔) - the thick cut barbecued pork was as awesome as I remembered... sooo tender, with marbled fat in the middle. The roast pork belly, however, was too lean and tough for my liking. It's snake season and I heard from some friends that they are now offering snake bisque (蛇羹), so I made a special request to add this to our lineup. This was one of the best snake soups I have ever come across. The level of knife work is clearly evident, and the flavors of the ingredients plus the stock were absolutely delicious. The only issue I had - and this comes down to pure personal preference - was that the chef had put in too much shredded ginger. This changed the balance of flavors and kept it from being purely elegant and delicate. The spicy kick at the end was a little too much for me. The kaffir lime leaf chiffonade was also very fine here. Crab claw, steamed egg white with ginger and vintage Chinese wine (薑米酒蒸鮮蟹拑) - very nice. The texture of the crab meat was perfect, and the flavors of the wine were infused into the egg white. Deep-fried duck fillet with cristal blue shrimp mousse (藍天使蝦水晶香酥鴨) - probably the only dish I didn't like. This is a variation on 香酥鴨 but they added a layer of shrimp paste, and the end result was that there was hardly any duck. I also didn't really like the texture of the mash in the middle, as it was just too wet and sticky. Served with a "lemon sauce" that seemed to have been made with preserved (and salty) lemon rind. Supreme de-boned spare ribs with homemade sweet and sour sauce (至尊京都肉排) -wow! This was pretty impressive. Very tasty both in terms of the pork and the sauce. Served with a pile of shredded onions on the side. Underneath the crisp batter - which was lathered with a sweet and sour sauce made with Italian tomatoes - was a millefeuille of pork. There were at least 3 layers of thinly-sliced pork in this combination. Braised beef ribs in The 8 style (8餐廳特色炆原條牛肋骨) - braised for 5 hours. This was OK, but not particularly special. Served with chestnuts, ginkgo nuts, mushrooms, goji (枸杞) berries... etc. on the side. This was not tough, but also could be a little more tender and juicy. Steamed Japanese bean curd pocket stuffed with imperial fungus and sea mosses (羅漢布袋) - I had this on my very first visit, and the texture of the pocket is always interesting. 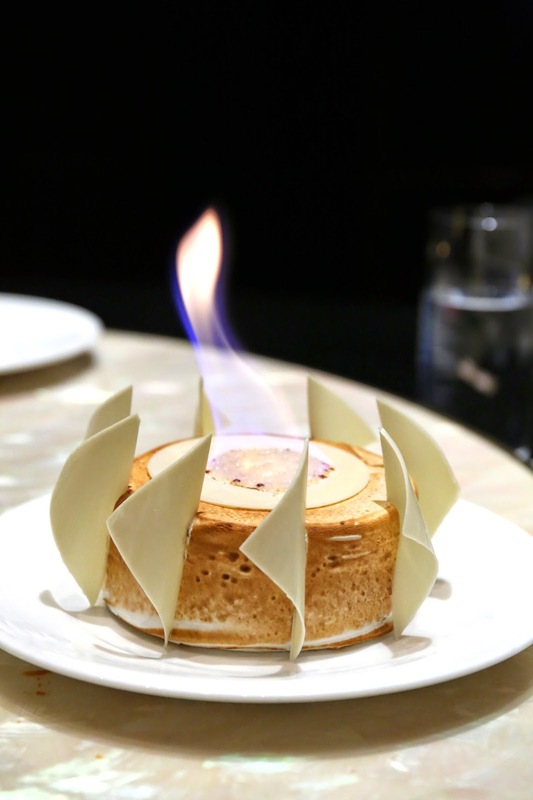 Baked Alaska with red bean sorbet (火焰椰子紅豆蛋糕) - interesting that this is often the cake served to guests celebrating their birthdays at the restaurant. I actually did like this a lot... as it's been a while since I last had a baked Alaska. The flavors from the red bean weren't overpowering, and worked well with the coconut. Last, but not least... the Portuguese egg tart (葡撻) and that amazing lil' cup of milk tea. The tarts today no longer look scrawny, so they were more satisfying. I gotta say... this is still the best cup of milk tea that I've tasted anywhere. I dunno what it is, but the Lisboa is justifiably proud of it. Whenever I dine within the Lisboa complex, what I look forward to the most is actually the wines I drink with my food. They really do have the best cellar in Asia, and I make it a habit to browse through it before I even get to Macau. This time I picked out a few bottles that I wanted to drink, and asked the PR team to arrange for the restaurant to set the bottles out for us ahead of time. 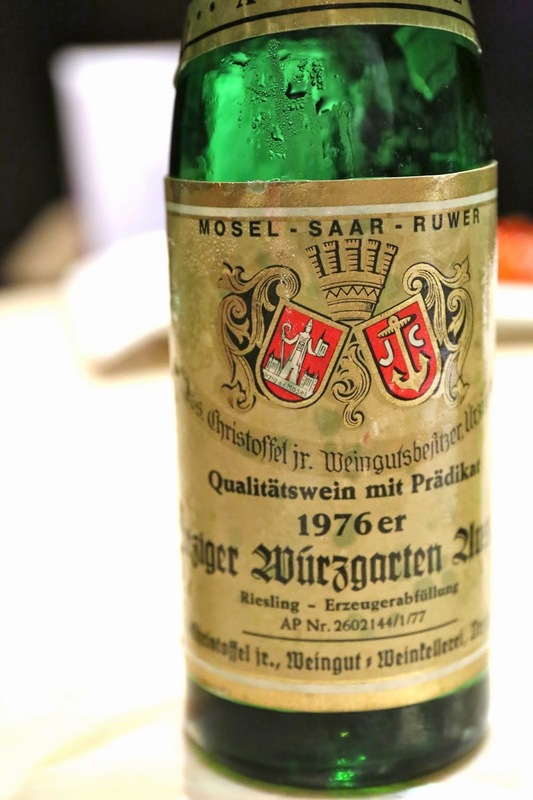 1976 von Hövel Scharzhofberger Riesling Auslese - initially nose of plastic, honey, orange marmalade. Tasted really nice with the prawn dumplings. Elegant and beautiful, fresh but a little more mature than the last bottle earlier this year. More minerality here with white flowers after breathing. 1976 Jos. 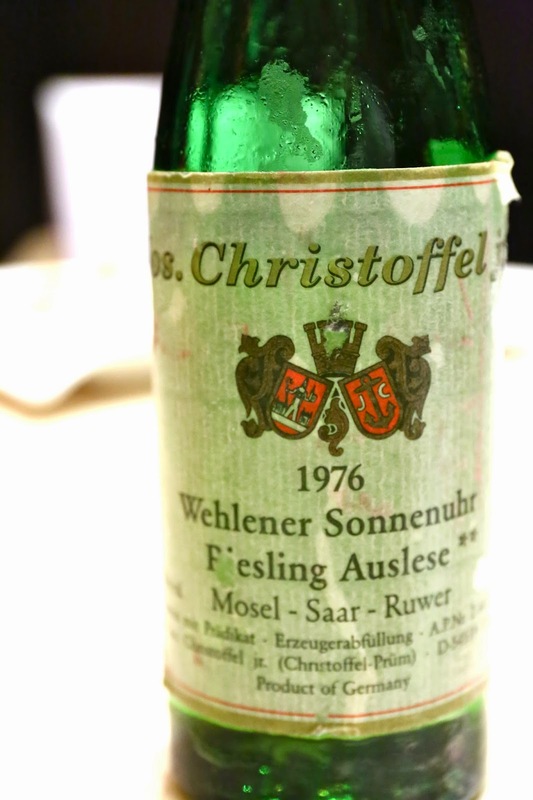 Christoffel jr. Wehlener Sonnenuhr Riesling Auslese ** in half bottle - initially more muted on the nose and lighter on the palate. A little bitter on the palate at first, with marmalade. After breathing this showed much better, with a little spices like nutmeg... like a spiced orange marmalade. Definitely my favorite of the evening. 1976 Jos. Christoffel jr. Ürziger Würzgarten Riesling Auslese *** in half bottle - bigger on the palate initially, and pretty nice. Palate turned a little more bitter later. Least favorite bottle of the evening. What a meal! I'm glad I got the chance to try out a range of dishes that I've never had - several of which are new on the menu. In my mind, this is still the best Cantonese restaurant in the region. Their pursuit of excellent is clearly evident when you look at the care with which ingredients are chosen, the attention to detail in terms of the knife skills of the chefs, the presentation... etc. So the only question I have is: why am I not coming back here every month, or at least every other month?! I love this restaurant, just everything of it! Thanks for sharing and it recalls my happy dining experience there.